Size 4 Ben Ten Flannelette Children's Winter Pyjamas. This two piece Ben Ten pyjama set is 100% cotton. The material is soft and cosy for a perfect winter nights sleep. Boy's will love the Ben Ten print. 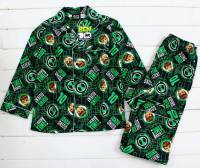 These Ben Ten Pyjamas are also available in Size 2, Size 3, Size 5, Size 6, Size 8, and Size 10.